7 Facts and an Award! Happy Saturday Everyone! I hope everybody is having a nice weekend! I’m enjoying my weekend by sleeping in and doing lots of cooking! I hope you’re ready for some great recipes this week! I also wanted to take this time to thank all of you who continue to follow and support my blog! 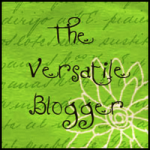 I am still new at this and have so much more to learn about blogging! As a thank you to all of you, I will be hosting my first giveaway within the next two weeks so make sure you keep an eye out for it! This past week, I was awarded with my first blog award from one of my favorite bloggers, Ann, from Cooking Healthy For Me! 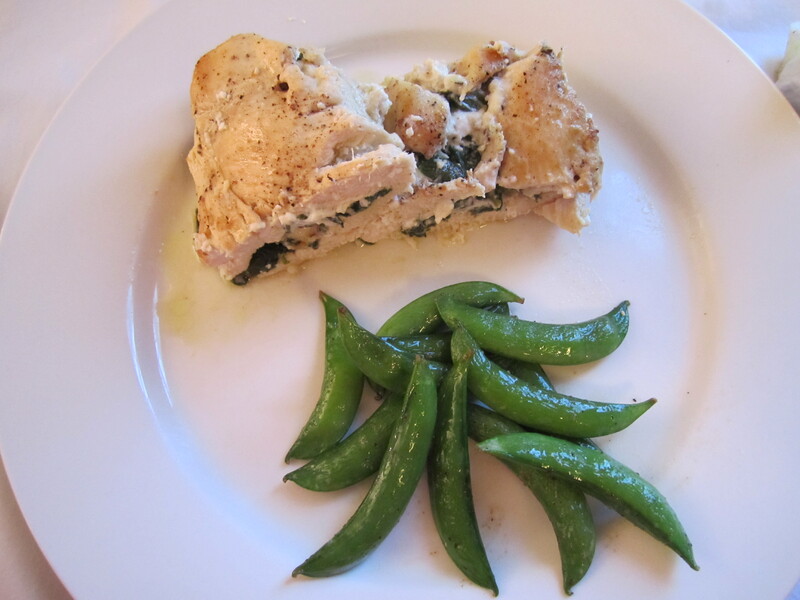 Ann is so sweet and I love her blog because it is filled with wonderful, healthy recipes! I was so excited to receive this award from her! Thank you so much, Ann! 3. Pass the award along to 15 other bloggers! So, to start, here are 7 random facts about me! 1. I’m working on my Ph.D. in developmental psychology. I hope to finally finish my program next summer so I can finally be Dr. Stephanie! 2. I’m OBSESSED with Coach. Coach bags, Coach accessories, Coach shoes, Coach key fobs, you name it. My husband is not thrilled about this expensive obsession…. 3. I don’t swear very often, but put me in front of a game of Mario Kart and I will curse and scream like a sailor. Nothing gets my blood boiling like a game of Mario Kart against the computer which cheats like there’s no tomorrow. I’m getting upset just thinking about it! 4. I’m totally overwhelmed by space. Just thinking about how vast our universe is and how much we know, don’t know, and will never know just blows my mind. My husband likes to talk about it before we go to sleep so that I can have nightmares about it! Eeek!! 5. I’m obsessed with nail polish. I have tons of bottles and I can’t stop buying more! I don’t like when my nails aren’t painted! 6. I HAVE to eat Tic Tacs in two’s. I can’t eat just one, and I can’t eat 3 or more. Just two. 7. My favorite tv show is Friends. I got my husband addicted to0. We are now both so addicted that Friends dvds are in constant rotation in our house. When nothing is on tv, we put in a Friends dvd for background noise. We’ve seen every episode at least 50 times (except for seasons 9 and 10, we don’t like those seasons as much) and it never gets old! I’m not sure what it is this week, but I am just totally exhausted! And it is a short week! Is it bad that I am already wishing it was Friday?! I need to sleep in!! Anyway, onto the food. I love goat cheese. Seriously, I could eat it every day. 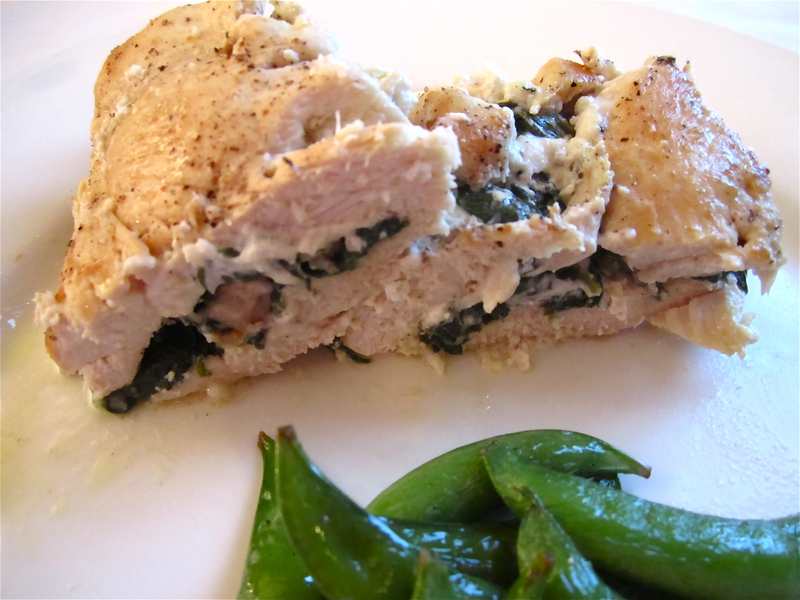 With crackers, on bread, on pasta, in a house, with a mouse, in a box, with a fox, or in this case, stuffed into some chicken breasts with some lemony spinach goodness!! 1. Preheat oven to 400 degrees. In a pan, heat 1 tablespoon of olive oil. Add garlic and cook for 1 minute. Add spinach, season with salt and pepper, and cook approximately 2-3 minutes until spinach is wilted. Put spinach in a small bowl. Zest lemon into bowl. Add goat cheese and combine ingredients. 2. Clean and trim chicken breasts. Slice each chicken breast almost in half (but do not cut all the way through). Drizzle a little olive oil into each the pocket (about half a tsp. for each breast) of each breast and sprinkle with salt and pepper. Divide cheese mixture evenly between both breasts. Secure breast with toothpick(s). Sprinkle some additional salt and pepper on top. 3. In a pan, heat remaining olive oil, add chicken breasts. Cook on each side approximately 3 minutes until chicken begins to brown. In a small (I used a 9 x9) baking dish, add browned chicken breasts. Pour broth, wine, and the juice of one lemon evenly around the dish. Cover with foil and bake for approximately 15 (remove foil the last 5 minutes) or until chicken is cooked thoroughly. Remove toothpicks, drizzle with sauce from the baking dish, and serve! 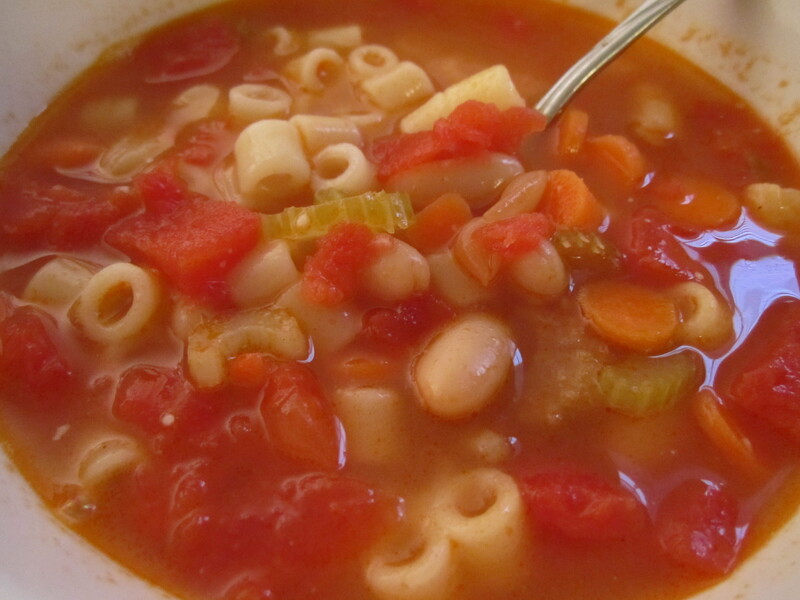 You may be thinking that Pasta Fagioli is an odd recipe to post on Labor Day. And you’re right, this soup does not scream Labor Day at all! Don’t worry, we’ll be having Southwest Burgers for dinner tonight. We spent the weekend in Orlando visiting my family and were planning to stay until this evening, but after hearing that some bad weather from Tropical Storm Lee was headed to Tallahassee today, we decided to come back a day early. So we made the 4-hour drive. Of course, when we got back into town, it was already pouring. But alas, we had no food in the house and made the dreaded trip to the grocery store. I hate going to the grocery store. I know, I know, how can a foodie hate going to the grocery store?! I just hate it, I wish I could just pay someone to go for me and could just have it all delivered to my house like a 95 year-old woman…So yeah, going to the store and in the pouring rain was the last thing I wanted to do last night! After having the discussion with the hubs about what to have for dinner, I decided it was definitely a soup kind of night. 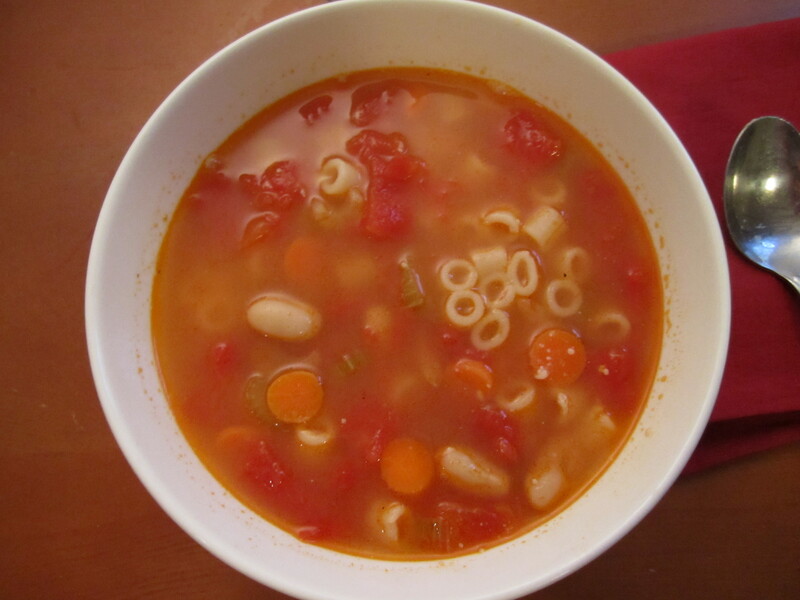 Pasta Fagioli, or Pasta e Fagioli means pasta and beans in Italian. I have been eating this soup since I was a little girl and it’s one of my favorites! I’ve had a lot of different versions of Pasta Fagioli, some with meat, some spicy, but my favorite one is the recipe my Mom and Grandma use (duh!)! If you want to kick this up a notch, add some crushed red pepper! 1. In a large pot, heat olive oil on medium high heat. Add garlic, celery, and carrots. Cook for approximately 3 minutes. Add diced tomatoes (including the liquid). Allow mixture to simmer and for tomato liquid to cook down a bit, approximately 3-4 minutes. Add broth and bring to a simmer, lower heat to low. Add salt and pepper to taste. 2. In a separate pot, cook pasta. Allow pasta to be slightly al dente as it will continue to cook more when added to soup. 3. Discard about half the liquid from the beans and then pour the remaining liquid and beans to soup. Add additional salt and pepper if needed. Add pasta to soup. Serve with Parmesan cheese sprinkled on top! Well folks, labor day weekend is upon us and this means that the fall season is almost here! I’m not sure where the summer went, but I’m SO looking forward to my favorite time of the year and hopefully some cooler weather! This dry, Florida heat is killing me! I am already counting down the days until October 1st so I can start decorating for Halloween (one more month to go!!). One of the other great things about fall is football season! And what better way to celebrate football season than with a bunch of junk food?! Pizza, wings, chips and dip, you name it! But, of course, none of those things are very healthy so I am all about finding healthier substitutes for my favorite game-time foods. 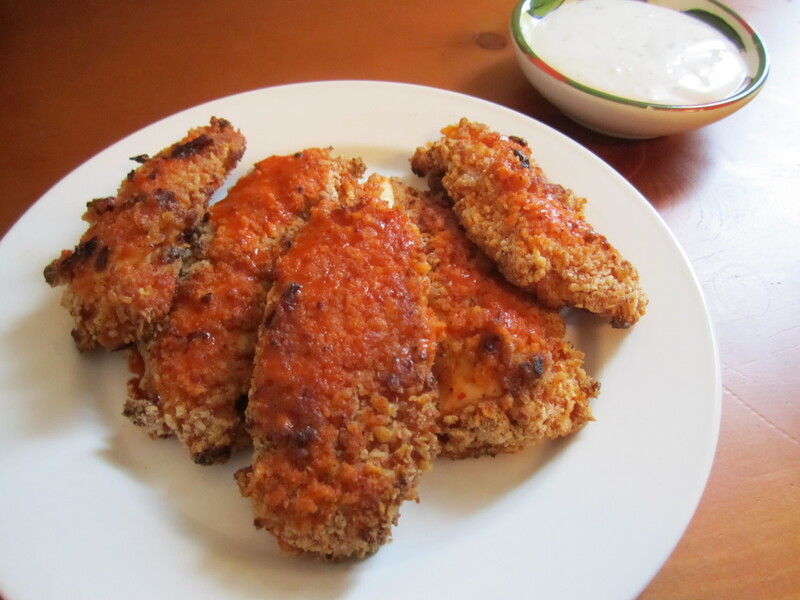 I first saw this recipe for Buffalo Chicken Tenders on one of my favorite blogs, How Sweet It Is. All I needed to see was the title to know that I had to make these for me and the hubster! These chicken tenders are healthier because they are baked, not fried. They also use whole wheat flour and panko bread crumbs. 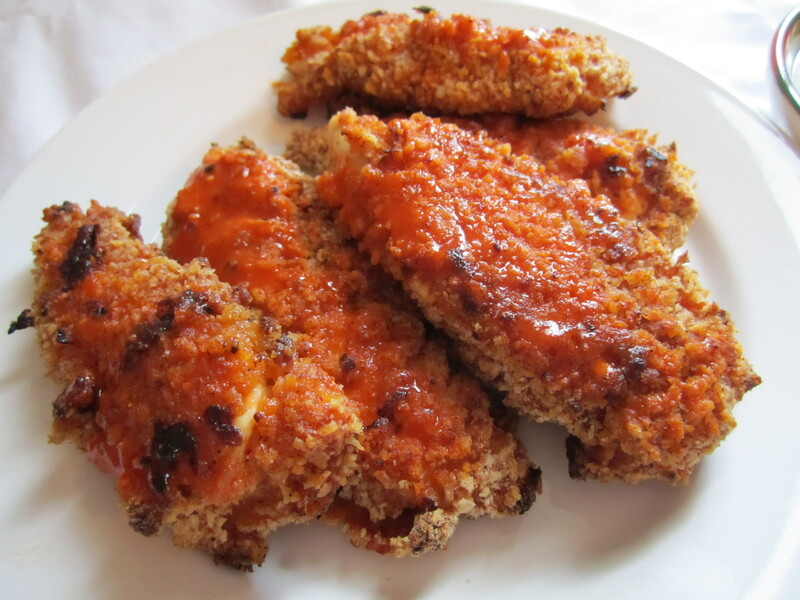 These tenders came out really good and the buffalo sauce gives them a nice little kick. We dipped ours in ranch, but blue cheese dressing or gorgonzola dressing would also be wonderful with these! 1. In a bowl, combine buttermilk, Frank’s Red Hot Buffalo Sauce, apple cider vinegar, chili garlic sauce, and 2 tsp. of salt. Whisk together. Add the chicken and marinate over night. 2. Preheat oven to 450 degrees. Spray an oven-safe wire rack with cooking spray. 3. Combine panko, flour, cayenne, 1 1/2 tsp. salt, and paprika in a large bowl. Dredge chicken in the flour and breadcrumb mixture. Place chicken tenders on a wire rack. Spray each tender completely with more cooking spray. Bake for approximately 10 minutes. Turn over and spray other side with cooking spray and bake for another 5 minutes or until chicken is cooked completely. Using a pastry brush, brush more of the buffalo sauce on top of each tender and serve. – When I first made these, I used skim milk and I didn’t have a wire rack. This made the breading come off really easily and they were a little hard to eat with our hands. Make sure you use a wire rack to avoid getting the breading stuck to the pan. Jessica, from How Sweet It Is also told me that if you don’t have buttermilk on hand, you can make your own! Just combine 1-2 teaspoons of lemon juice/vinegar to 1 cup milk, stir and let sit about 5-10 minutes! It’s the first day of a new school year (and hopefully my last year as a grad student!). Summer is over and this means that the joys of being able to come to campus whenever I want and to be able to find a parking spot no problem is over. It’s back to waking up super early, rushing to campus, and then battling it out with a bunch of 18-year-olds for a parking space (no offense to any 18-year-olds reading this…). But, there are two good things about fall: 1. cooler weather and 2. SEMINOLE FOOTBALL! Now, onto the food. 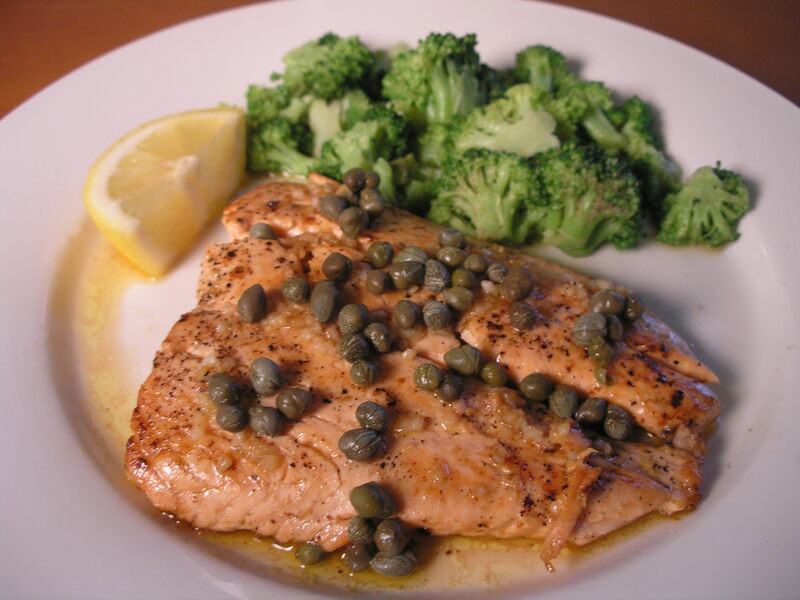 When it comes to seafood, I always prefer simple, light, citrus flavors. We have salmon about once a week and this is the way the hubs and myself like to cook it. This is a quick and easy dish to make. You can turn it all out in about 15-20 minutes, which during the week, this is my kind of meal! 1. Heat olive oil in pan. Sprinkle salmon with salt and pepper. Add to pan skin side down. Add half of the lemon juice. Cook for approximately 3-4 minutes and turn over. Scrape skin off fish and discard. Cook for an additional 4 minutes. Turn over once more and cook for 2 minutes or until fish is cooked to your preference. Remove fish from pan. 2. Without cleaning the pan, add butter and garlic. Cook for 2 minutes. Add remaining lemon juice and bring to a simmer. Add capers. 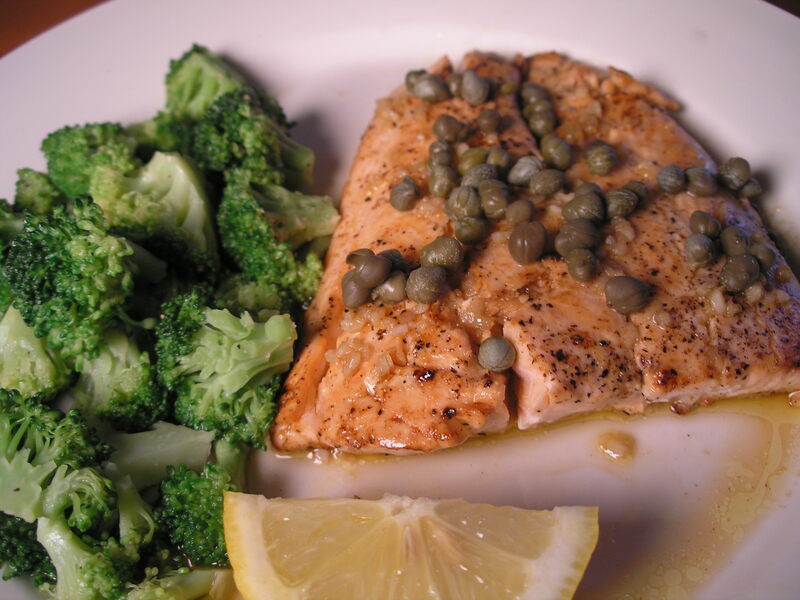 Turn off heat and pour sauce evenly over fish and serve. I’ve been making this dish for many years, but I don’t really know what to call it. I like to think that I am a pretty creative person, but not today. So let’s just call this one Mexican Turkey Bake. 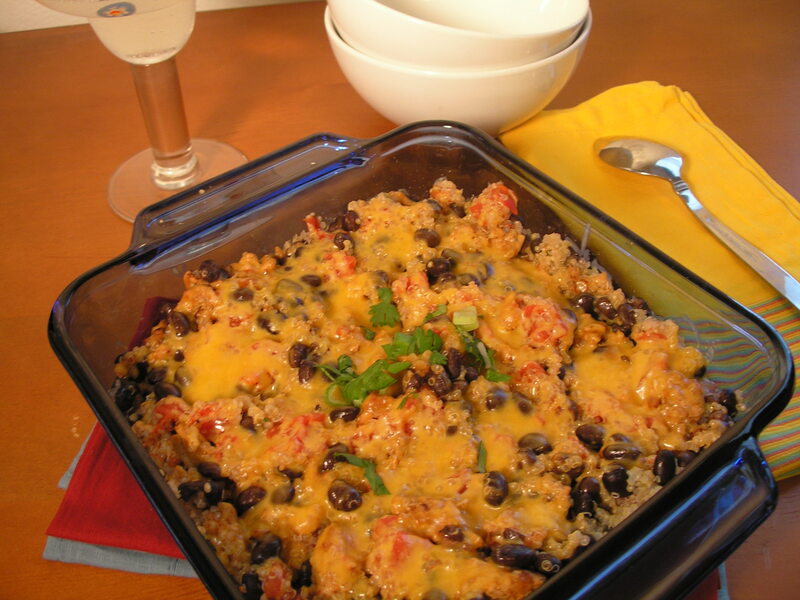 Cuz, you know, it has mexican flavors, and turkey, and stuff… ANYWAY, I like it because you can just throw it all together pretty quickly and it’s a good protein-packed meal with the black beans and turkey and it will fill you up fast! The great thing about this recipe is that you can change up the ingredients really easily depending on your personal tastes. I used ground turkey, but you could also use ground meat or ground chicken. And because I am trying to stay away from heavy starches, I used quinoa, but you could totally use white or brown rice! And of course, I had to have a glass on Skinnygirl Margarita with it! 1. Preheat oven to 350 degrees. In a saucepan, cook quinoa or rice in 2 cups of water until liquid is absorbed. Add salt and pepper. Set aside. In a sauté pan, heat olive oil and add onions. Cook for 2-3 minutes. Add meat. Sprinkle with some salt and pepper and cook for 8 minutes. Prepare taco seasoning according to package instructions. Add to meat and cook until liquid is absorbed. 2. 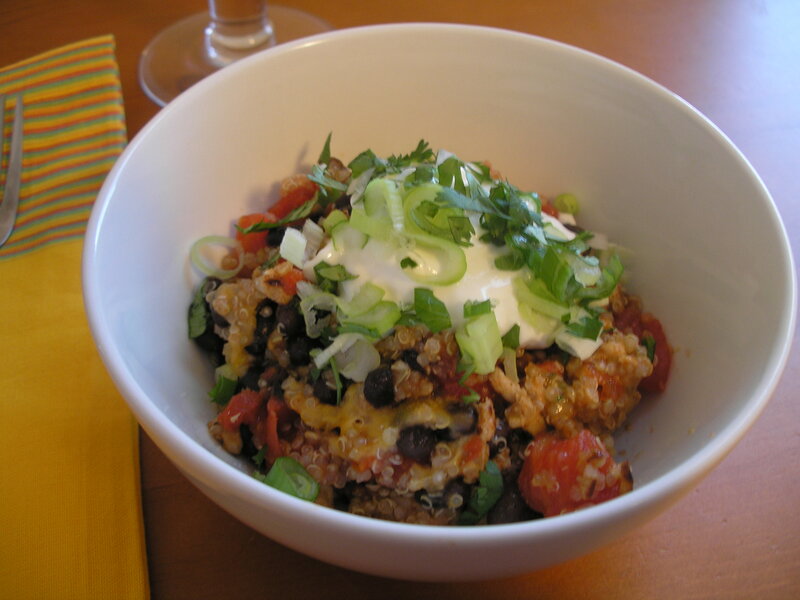 Add diced tomatoes, black beans, and meat to quinoa and mix. Add mixture to a 9 x 13 baking dish. Sprinkle with cheese, cover with foil and bake for 10 minutes. Remove foil and bake for another 5 minutes until cheese is melted. Remove from oven and scoop into bowls. Top with toppings of your choice and serve!